What are post translational modifications? 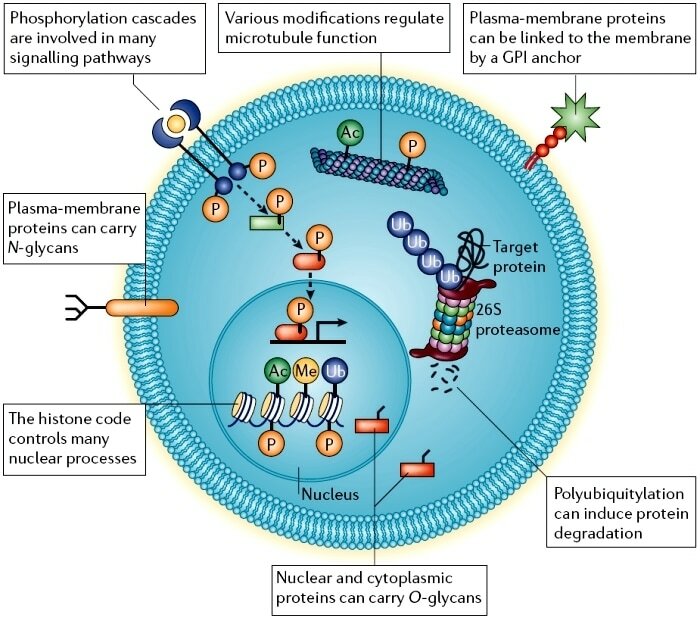 Once a protein has been translated it can be altered further by a variety of modifcations, these are referred to as Post Translational Modifications (PMTs). PMTs confer a large advantage to an organism, they increase the protein diversity of a cell or organism in a way that is reversible, so they can be useful in responding to environments. There are multiple types of PMTs including phosphorylation. Phosphorylation is the addition of a phosphate group, most commonly to a serine, threonine or tyrosine residue. Ordinarily phosphorylation has been shown to have a part in signalling but incorrect signalling may cause disease. I used NetPhos data to predict potential phosphorylation sites for RASSF1A given its FASTA sequence. The database gave predictions for the three residues commonly phosphorylated, serine, threonine and tyrosine. The pink line indicates a threshold, so those below the line have a low confidence. I carried out the prediction on both human and mice RASSF1A sequences. You can see that the there are a lot of similarities in predictions between the two sequences, especially in regions where they share domains. This is likely due to the highly conserved sequence between the two (91%). Phosphorylation prediction may be important for RASSF1A since it is implicated in signal transduction.